C.1929, Waterbury Clock Co., "Ship's Bell No. 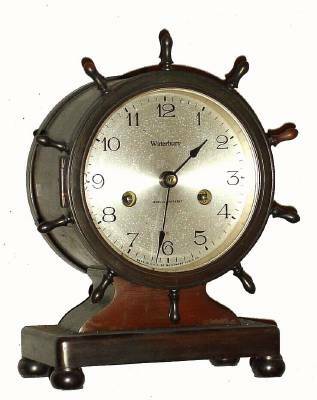 17", 8-day ship's bell mantel clock. Condition: Heavy bronze case is in nice clean condition. Original silvered dial is very clean with some slight tarnish. Hands are original. Ticks and strikes, despite the dirt. Excellent as-found cond.. Ht. 8"